I know I was a baby that used to crawl. I know I'm a biker. I can be the best cleaner. I know how to climb. I can damn sure rhyme. But most of all, I love to fight. 4. I am tall. 9. I am NOT a Buc! 5. I am evil. 10. I am intelligent. 1. I can play volleyball. 6. I can fight. 2. I can play football. 7. I can shop. 3. I can play basketball. 8. I can read. 4. I can play baseball. 9. I can write. 5. I can clean. 10. I can ride a bike. 1. I know that I'm bad. 6. I know that cheetah's run fast. 2. I know how to text. 7. I know how to rap. 3. I know Ms.Burton steals. 8. I know how to rap poetry. 4. I know how to fix a computer. 9. I know how to climb. 5. I know I'm very ... annoying. 10. I know how to be extremely messy and funny at the same time. -Janet jumped joyously for jellybeans. -Pretty Patricia picked peaches for preserves. -Lunch at West Jeff are okay, but my mom's food is better. -Ms.Burton get so mad in class, her voice throws knives. -Our class is so hard; Ms.Burton works us like slaves. -Love is like a brain malfunctioning on purpose. -My personality is like a river, sometimes rough and fast, but also calm and soothing. My personality is like a river, with smooth waters and typhoons. -The ducks went quack-quack in annoyance. -My teeth chattered in the freezing temperature. -The cool AC cooled my sincerely. -My favorite place is Olive Garden, yes! Before you judge it, put it to the test. I assure you the best. -Just do it, you know you want a sip. Just do it, you know you need a thirsty drink. Just do it, it's in you. -My mom's anger is worse than a raging bull. "Sympathy" by Paul Lawrence Dunbar is a poem that he expresses his struggle with slavery and his desperation for freedom. Inside of his poem, there are 3 stanzas and 7 lines each. This is one one his most famous poem worldwide. He explored the themes of slavery in order to write this poem. "And the river flows like a stream of glass"
--In this quote, he was obviously describing the river in the poem/story. How it was clear and smooth like glass or a mirror. "I know why the caged bird beats his wing till its blood is red on the cruel bars;"
--In this other quote, he's saying that the bird is beating his wings too much and has broken his wings and is bleeding. "But a plea, that upward to Heaven he flings---"
--In this last quote, it's saying that the bird isn't singing with joy. He's so desperate that he sends a prayer to be free from being caged. My opinion on this poem is that it's not only about a caged bird but about our lives in genera. Nobody can every be peaceful or relaxed in captivity. The bird is a symbol for our own griefs. 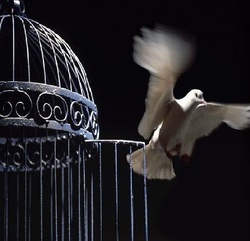 Simile- "the river flows like a stream of glass"Metaphor- Caged birds= slaves or African Americans that are NOT free. Rhyme- Alas, grass, and glass.Repetition- I KNOW how the caged bird feels.